This day was quite a killer due to the heat. There was a short ride to the ferry terminal, then a ferry to the nearby island of Cres (the ‘c’ being pronounced like the ‘z’s in “pizza”). By the time we made it off the ferry it was getting towards the middle of the day. The first 8km or so off the ferry was a steady climb and the heat was really getting to us. We were a little disheartened by the time we got to Cres town. The Melbourne couple we met on the ferry Matt and Vanessa seemed to fare a lot better on their 8 speed commuters! We spent the whole afternoon drinking beer, eating icecream, and trying to hide in the shade. We couldn’t catch a ferry out of there though, so our only option was to continue riding down the island. The first 12km was uphill, but then it was flat along the top of the island. There was a fantastic bit of new smooth road which was easy riding. Osor was another well positioned campground near a town. 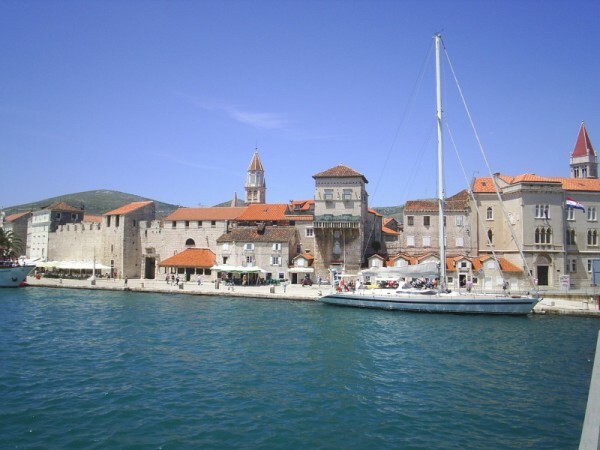 Although the town of Osor wasn’t as nice as Krk, it had its charms. It’s a small town of about 80 people, with a centre square with stairs leading into it and a couple of small cobbled streets. 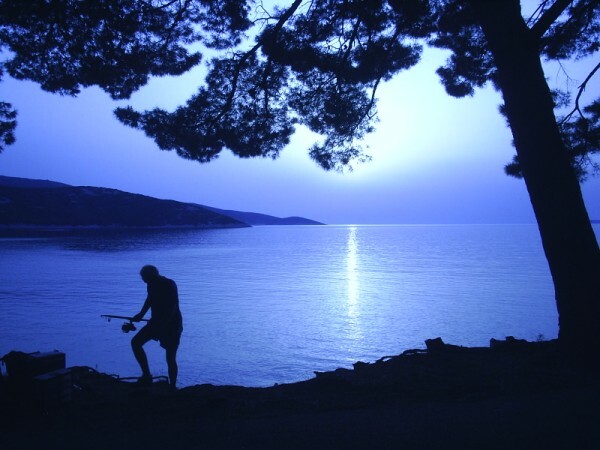 The town guards a small bridge over the channel between the islands of Cres and Lošinj. We enjoyed a dinner of spaghetti with a couple of beers as we watched the sun sink below the waves. We left Rijeka and started out down the coast road of Croatia towards the island of Krk. There’s quite a lot of traffic and it was quite a change from our relaxed Slovenian experience. The cars didn’t give very much space, particularly the buses. I was driven off the road by a truck who was a bit impatient to overtake on Krk. Against the warnings of some locals we rode through the middle of the day, and the heat was quite oppressive. Particularly as we were told of a “shortcut” that took us up and down some steep hills before taking us back to the main road we had started on. The bridge to Krk was also kind of strange as we were directed by a toll operator to take the footpath, but that led us into a large set of stairs, so we reversed up and took the main road instead. We’re learning quite quickly that the advice of locals here is not always of a high quality (apart from “don’t ride in the middle of the day”), although it seems they mean well. We made it to the town of Krk and settled into the campground there. It’s quite fantastic as it’s only a short walk from the town centre. Krk is a very beautiful walled town and we spent the evening enjoying beers and the company of a friendly german shephard, who was very well mannered and seemed to want to act as our tour guide. This was one of our best stops of the trip because of the facilities of the campground and it’s proximity to a very lovely town. Although it was very hot, we were relieved that there was finally no sign of rain clouds. For the entirety of the trip before we reached Croatia it was either raining, or there was the threat of rain. Now the skies were clear and we had a great excuse to take a break in the middle of the day for ice cream and beers. Good roads, with not much traffic. Lots of bike shops and bike paths. 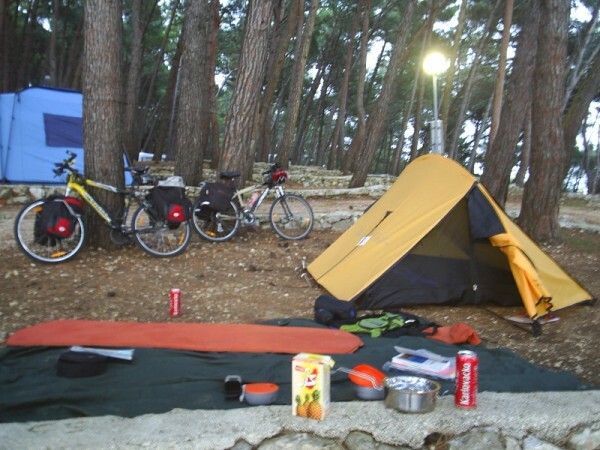 Campsites are generally reasonably priced and good quality. Slovenia is an excellent country for cycling. A lot of locals cycle, even in the mountainous areas, so the infrastructure is there and the car drivers have a “share the road” attitude. It is a mountainous country, but when we weren’t going over a mountain range it was usually a nice steady incline or decline along a river. I would highly recommend everywhere we went. You may wish to skip the two big climbs (Vršič and the Kamnic Alps), but then you would miss out on the best views. Food was easy to come by except occasionally on Sundays, when the Mercator supermarkets were closed. The biggest negative was the unpleasant weather. It was raining most days and if not the threat was always there. I only ran into one other cycle tourist, and they were about to cut their trip short because of the rain. There were a few times we caught trains because cycling just wasn’t very pleasant. However locals told us that it was unusually wet for May, and when it wasn’t raining it was a great temperature for cycling. Later in summer it would almost certainly be better weather, but there will also be more tourists. Except in Bled there weren’t all that many tourists at the time we were there. We rode to Škocjan Caves in time for the first tour of the morning. The caves are nothing less than terrific. You walk through a series of large caverns to a section with a river running through it. It reminded me a little of the mines of Moria. The walkway goes along the sides of the cave with a river raging 100m below, and a high bridge crossing between the two sides of the gorge-like cavern. The river ends as a waterfall disappearing into the depths. It’s completely awesome. Sadly we weren’t allowed to take photos inside the caves. Afterwards we caught the train to Rijeka in Croatia, ending our Slovenian experience. Rijeka was a very busy city, but there’s not much else to say about it. We stayed at a hostel and looked forward to moving on in the morning. If you ever end up in Rijeka it will probably be as a stepping stone to or from the Croatian islands. In the morning we passed through a few more nice small towns before reaching Nova Gorica. Kanal in particular was memorable as it was Sunday and it seemed the whole town was walking the streets on their way home from church. Just before Nova Gorica was the largest stone arch train bridge in the world, which was very impressive. Nova Gorica is a young town with an interesting history. It was built after 1948, when a treaty left the traditionally Slovenian town of Gorizia on the Italian side of the border. A new town on the Yugoslavian side grew up to replace it. 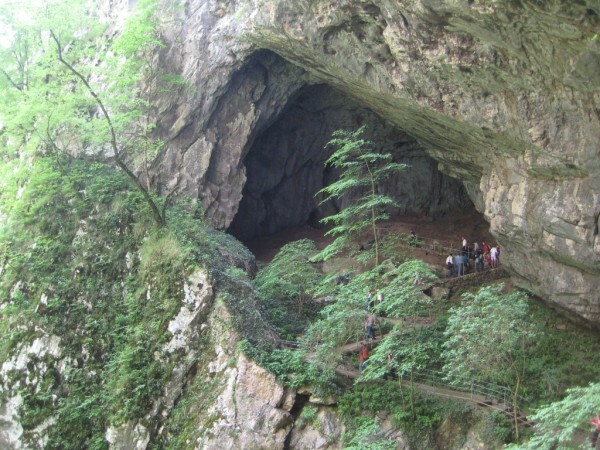 We planned to finish up our trip in Slovenia quickly and move on to Croatia, so the plan was to take a train from Nova Gorica to Divača to see the Škocjan Caves. However there was only one train from Nova Gorica and it was in the evening. About 10 metres from the train station was the Italian border, and a couple of kilometres from there was Gorizia train station, so instead we caught the train from Gorizia to Trieste which is about 20km from Divača. This turned out to be a bit of mistake – it would likely have been quicker and easier to cycle the rest of the way (it often is). Getting the train to Trieste was easy enough, but getting out of Trieste proved quite difficult. We had no maps and people we asked were of little help. When we did find the general direction it was a huge climb out on a narrow but very busy road with impatient drivers. I stacked it at one point after my front panniers got caught in a hedge on a narrow path. I received a few cuts and bruises, but nothing major. It was an unpleasant ride, but had I had the OSM Cycle Map I carry with me on my phone these days, we would have known there was a bike route out of the city and it would have been a much more enjoyable visit. We ended up reaching the border a little out of our way but heading in the right direction. By then it was time to pack it in so we found a campground on the Italian side. The hard gravel pitch was a disappointment after all the nice Slovenian campsites. Our side trip to Italy was shortlived and not so fun, but eventful.